The School for Conflict Analysis & Resolution invites you to come for a discussion on Wednesday, September 13, at 1:30PM at the Georges Room in the Johnson Center. This event is open to the public. 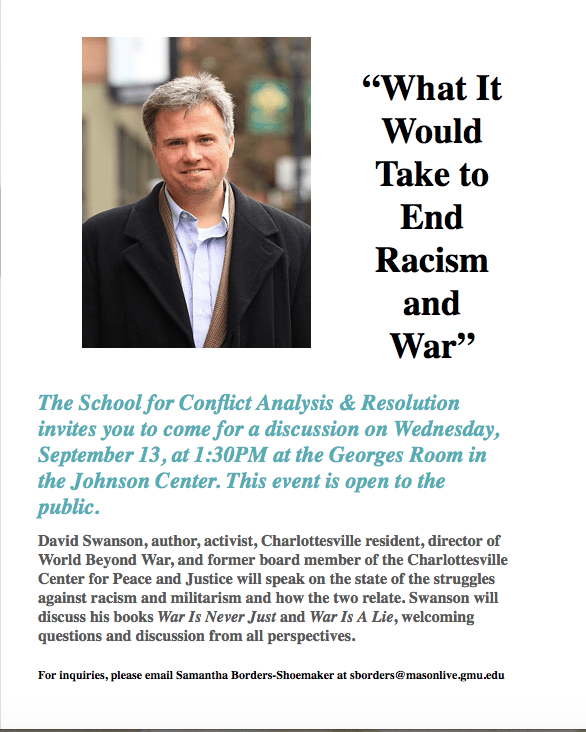 David Swanson, author, activist, Charlottesville resident, director of World Beyond War, and former board member of the Charlottesville Center for Peace and Justice will speak on the state of the struggles against racism and militarism and how the two relate. Swanson will discuss his books War Is Never Just and War Is A Lie, welcoming questions and discussion from all perspectives. David, I don’t question your intent, but It is far past time to stop critiquing existing situation and get on with embracing a viable plan to try and make the needed difference. To be successful it must be all inclusive. Conclusions are inherently divisive by nature, so something new needs to be introduced into this equation. I have sent information to you, but apparently it got sidelined by those delegated with the task of screening your incoming material. Please contact me and let’s discuss specifics. There is not a whole lot of time left in the human equation to get this thing right.